Klefki (STS #80), Electrode (EVO #40), and Shedinja (LOT #95) cards in the discard pile are treated as in play when doing damage for Rule of Evil if they were attached to a Pokemon when it was Knocked Out, which can result in a player taking more than the intended number of Prize cards. 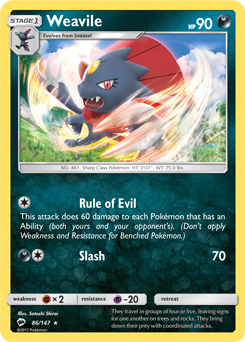 Due to the significant opportunity for exploitation, Weavile is temporarily banned from play until a fix for this bug can be deployed. This bug was fixed in the 2.60 update on Jan. 29.